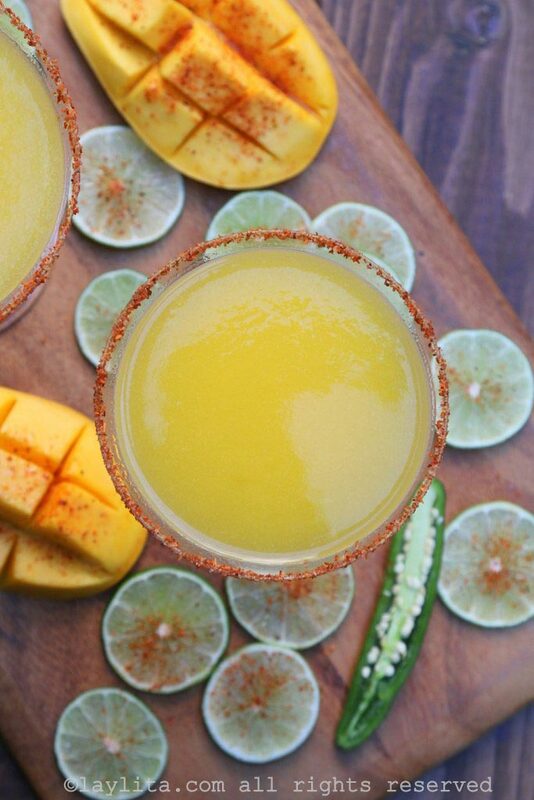 These homemade spicy mango margaritas are made with spicy tequila, fresh mangoes, lime juice, orange liqueur, sugar, and ice. I was introduced to spicy infused drinks a few years ago when I tried a spicy passion fruit cocktail and have been hooked ever since on the combination of sour and spicy in cocktails. 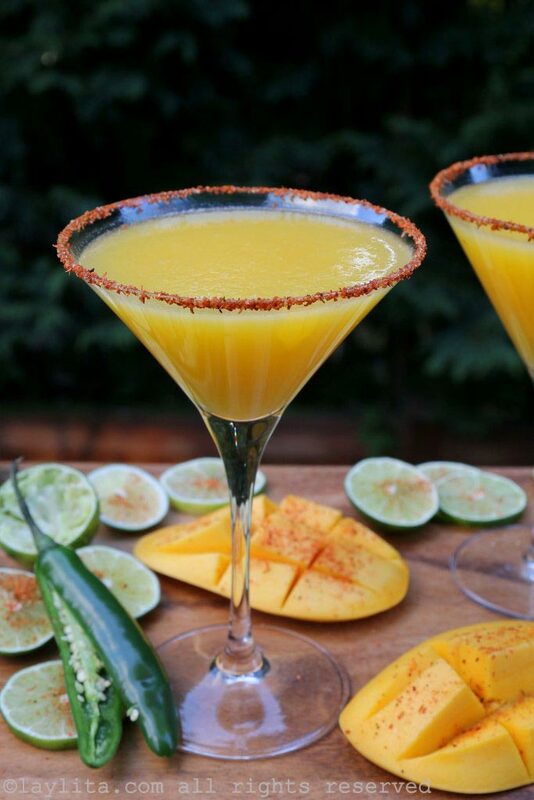 This spicy mango margarita gets its spiciness from using tequila infused with hot chili peppers, in this case serrano peppers. 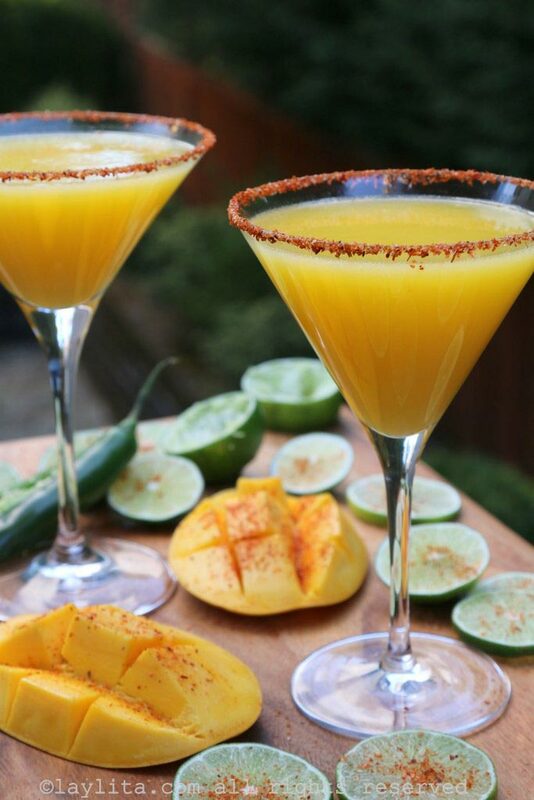 Spicy mango margaritas made with spicy tequila, fresh mangoes, lime juice, sugar, ice, and orange liqueur. 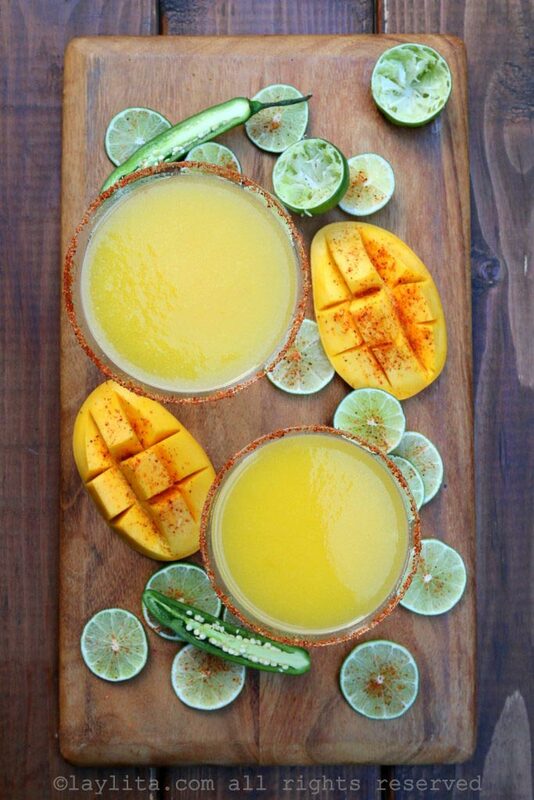 Combine the mango, lime juice, water, sugar, spicy tequila, orange liqueur, and some ice in a blender. 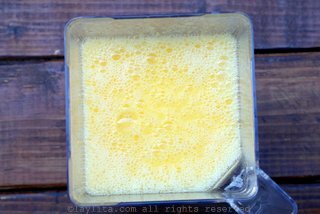 Blend until you have a smooth drink, strain if desired. Taste and adjust the amount of sugar and/or alcohol to taste. 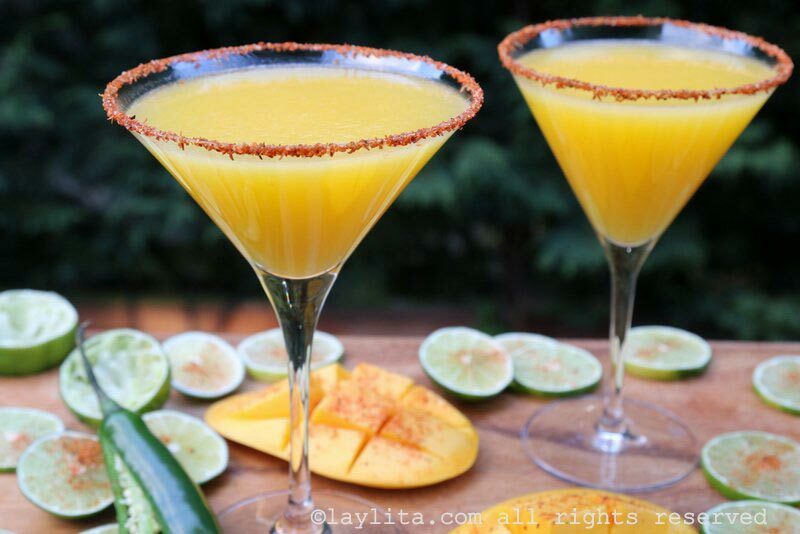 Place a few tablespoons of Tajin or lime chili salt mix on a small flat plate, moisten the rims of the cocktail glasses with a slice of lime, turn the glass upside down and then gently dip the rim and swirl it around in the Tajin mix until the rim is coated. 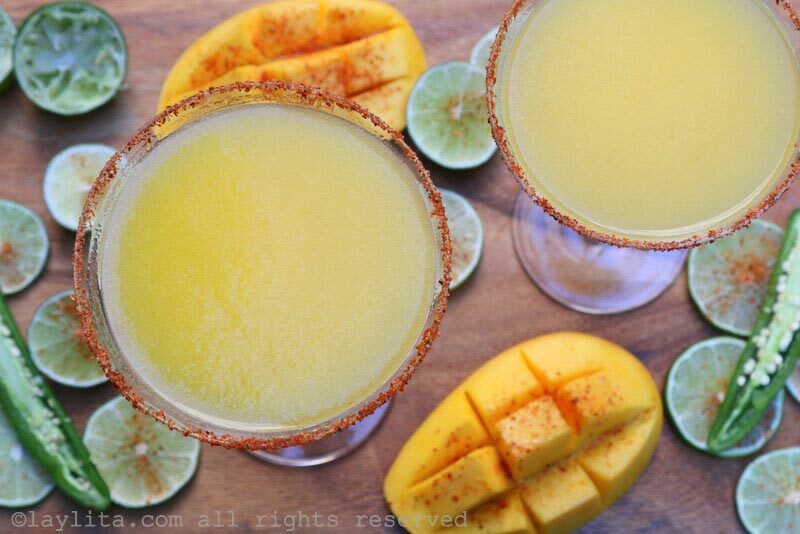 Pour the spicy mango margaritas into the cocktail glasses and serve immediately. These days you can find a large variety of infused booze, in many different flavors including spicy peppers, at most liquor stores. 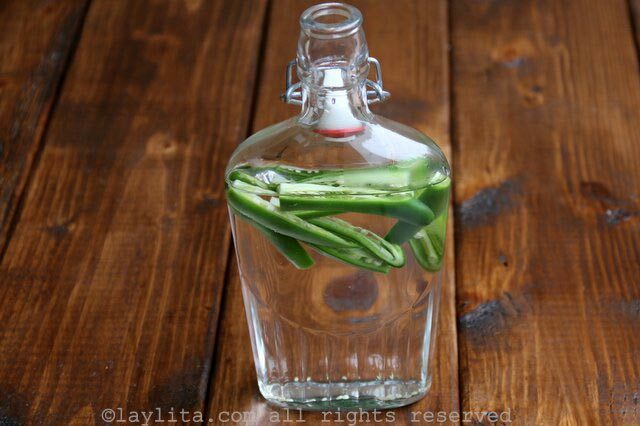 However, it’s also very easy to make your own infused spicy tequila at home. Simply slice a few hot peppers (serranos, jalapenos or habaneros for an extra spicy version), place them in a bottle or airtight container with tequila, and let them infuse for 1-3 days – taste each day to see if the level of heat is where you want it. The infused tequila can get very very very spicy quickly, so do not let it infuse for too long – especially if using habaneros. 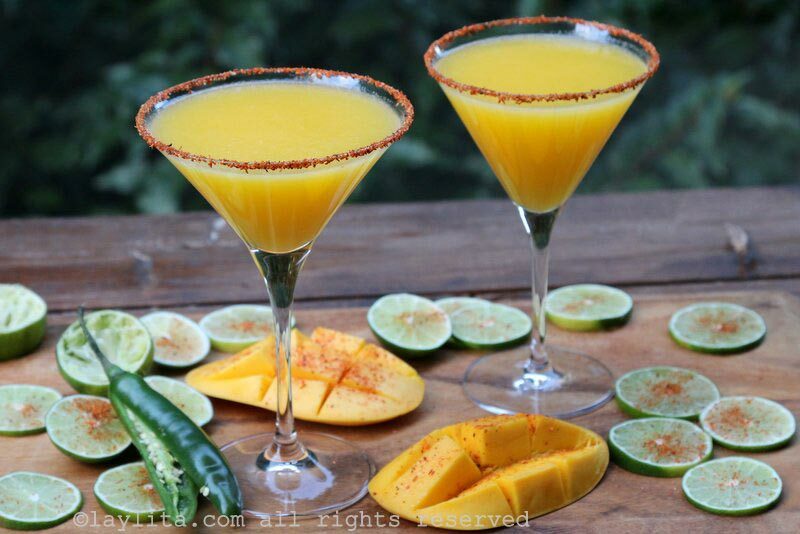 If you want to make this spicy mango margarita and don’t have any spicy tequila available or the time to let the tequila infuse, then you can make a quick simple syrup with sugar, water, and a sliced hot pepper. You could also let some slices of serrano pepper infuse into the lime juice, then strain and use the lime juice as indicated. 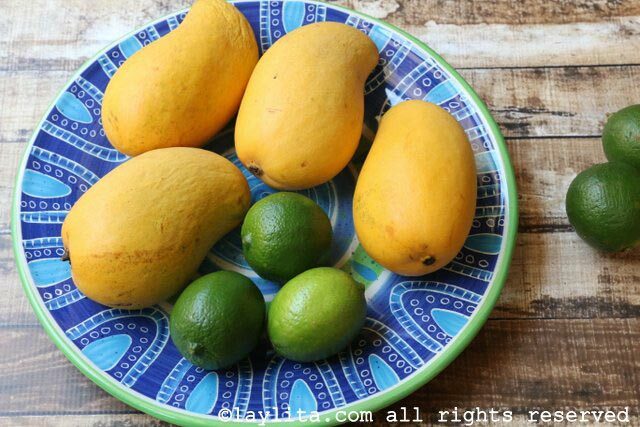 I used Tajin, a lime chili salt mix, to decorate the rims of the cocktail glasses – if you can’t find Tajin you can mix some salt (or sugar if you prefer a sweet rim) with some smoked chipotle powder and use it to decorate the rims. Yum, these look delicious! 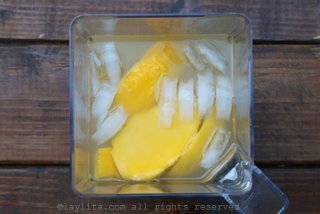 I love mango, especially in the summer!